While Garmin is well known for their range of GPS-enabled devices, this does not mean that they should just keep to their regular line of navigational tools that help you get from one point to another. No sir, there should be innovation always to push them forward, and rather than sit and rest on their laurels, the folks over at Garmin have decided to take the plunge into the smartwatch market, except that with Garmin’s expertise in GPS technology, you can be sure that their vívoactive HR GPS smartwatch will be different from the other models out there in the market. 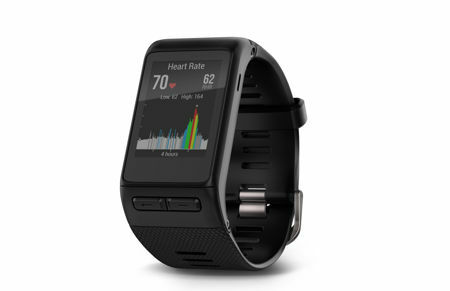 First of all, the vívoactive HR GPS smartwatch will sport Garmin Elevate wrist heart rate technology, allowing it to keep track of active moments throughout the day, as it does the difficult and mundane job of counting the number of steps taken and floors climbed, the intensity of minutes, monitoring sleep and featuring built-in GPS-enabled sports apps for walking, running, biking, swimming, golfing, paddle boarding, rowing, skiing and snowboarding. The vívoactive HR will make use of the 24/7 wrist-based heart rate data collected in order to calculate the amount of calories burned in addition to the intensity of fitness activities, offering proper credit for users’ array of workouts. Thanks to the Connect IQ store, users are able to easily personalize their vívoactive HR with free apps, widgets, watch faces and data fields. This unique smartwatch will boast of up to eight days’ battery life in watch/activity tracking mode (with 24/7 heart rate monitoring, no GPS) or up to 13 hours using GPS, in order to have it keeps up with users’ active lifestyles while ensuring they remain connected as well. It is capable of sending any notification from a compatible smartphone, where among them include incoming calls, texts, emails, calendar reminders, and social media alerts, making sure that you do not miss what’s going on in your digital life. Expect the vívoactive HR to start shipping some time in the second quarter of the year for $249.99 a pop, as it arrives in regular and extra-large fit black bands.